For more than a year, Scott Provencher has defined his life by “moments that matter.” The Seven Lakes resident, husband and father of four has collected a scrapbook of them. Provencher was diagnosed with Stage IV brain cancer in August 2011, and has since undergone surgery, radiation and chemotherapy. Three recent MRIs indicate that he is now in remission. Because his cancer has a history of recurrence, however, his chemotherapy was continued beyond the usual standard of care. “It’s my way of paying it forward,” Provencher says. Provencher’s FirstHealth experience began with a trip to the Emergency Department at MooreRegionalHospital, of which he has no memory. He was in South Carolina for a new job and had begun to have moderate-to-severe headaches and nausea. His wife, in her native Paraguay with their children to care for her ailing mother, had become increasingly alarmed by his slurred speech and lack of engagement during their telephone conversations and asked a friend to check on him. The friend brought him back to MooreCounty and MooreRegionalHospital, Provencher says, “because he really liked this hospital for how they had treated his mother.” Provencher was admitted to Moore Regional on Aug. 9, 2011. Soon afterward, Arsenia Provencher, just arrived from Paraguay, met with neurosurgeon Larry Van Carson, M.D., for an update on her husband’s treatment and to learn that he needed surgery to relieve pressure to his brain and to biopsy a mass on his temporal lobe. Six days later, by the time Provencher had been moved from surgical to neuro ICU, Dr. Carson had the results of the biopsy—glioblastoma multiforme, the most malignant and fastest-growing of all brain tumors—and an uncertain prognosis of maybe a month, maybe three months, maybe a year. According to both Provenchers, Dr. Carson delivered the news straightforwardly but with compassion, even speaking to Arsenia in her native Spanish. “Dr. Carson talked to us as though he was the patient,” Provencher says. Later the same day, Dr. Carson returned to Provencher’s room to discuss his recommended plan of action: first, surgery to remove the tumor followed by radiation and chemotherapy. A six-hour surgery to remove the tumor took place on Aug. 16, 2011. On Aug. 25, after completing all of his required physical therapy, Provencher went home with a walker, a cane, a treatment plan and a Cancer CARE Fund scholarship to FirstHealth’s Cancer Wellness Program. Radiation therapy, with radiation oncologist Stephen King, M.D., began on Sept. 8 and ended Oct. 26. 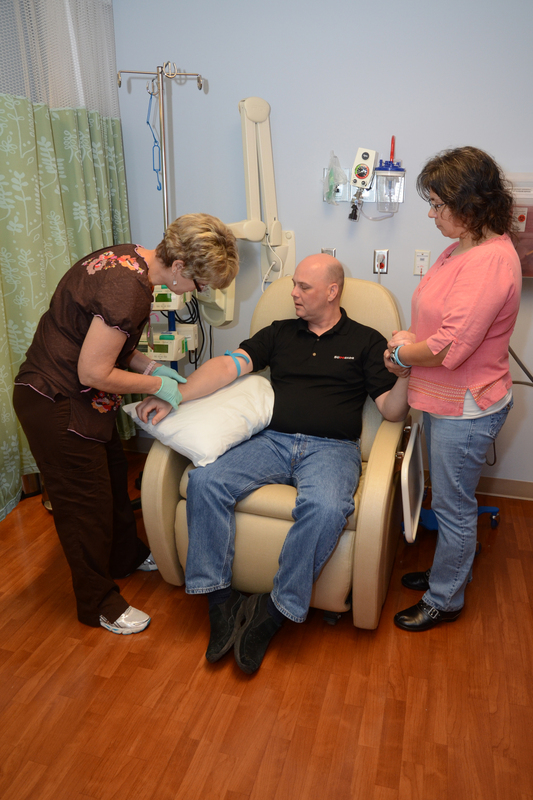 Chemotherapy, under the direction of medical oncologist Charles Kuzma, M.D., started a week later and continues. Provencher has encountered the usual side effects of treatment as well as a couple of unusual ones, but remains optimistic. The seven weeks of exercise and education with the Cancer Wellness Program at the FirstHealthCenter for Health & Fitness–Southern Pines undoubtedly helped. “(Instructor Cinnamon LeBlanc) got me to really push myself,” he says. Seemingly able to put a best face on even the most difficult of circumstances, Provencher has teamed up with his daughter, Carina, to create an acronym to describe his chemotherapy. He uses it when sharing all of the events of the past year. CHEMO, he says, means Caring Hearts Equals Miraculous Outcomes.